Even in today's visual and digital world, the way we evaluate and match colour is a direct result of work carried out almost a century ago by Albert H. Munsell. Most modern day mathematical colour systems are based on Munsell’s Theory of Colour. As far back as Issac Newton and his Colour Wheel, artists and scholars had wondered at the almost infinite variation of colour, but it was not until Munsell that anyone had combined the art and mechanics of colour to create a scientifically sound colour theory. Munsell’s groundbreaking work laid the foundation for today’s computerised colour matching systems such as Pantone and RAL Colour. A talented artist and gifted educator, Munsell developed his own colour theory based on what he defined as “perceived equidistance” a humans visual perception of colour. The result was a greater understanding of colour principles, bringing clarity to colour communication and establishing an orderly system for accurately identifying all colours. Munsell Colour Guides provide a visual representation of colour, with a tangible sample to help communicate and reproduce colour, ensuring consistentcy and accuracy. 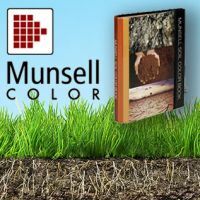 Whether you’re in government, business or academia, Munsell Colour Standards and the theory supporting them, serve as a reference in classifying, grading, specifying, production, branding and official standardisation. The large range of Munsell Colour Standards available today bear testament to Munsell's continued legacy of providing people with a way to easily and accurately communicate colour. Transforming his Theory of Colour into action.